Rung in memory of Tony Parry, founder of Campanophile, who died on 21st March 2019. This performance was rung in memoriam — Anthony Parry. Last updated Wednesday, 27 March 2019 at 22:47:38. First submitted Wednesday, 27 March 2019 at 21:16:47 by Andrew Christie. 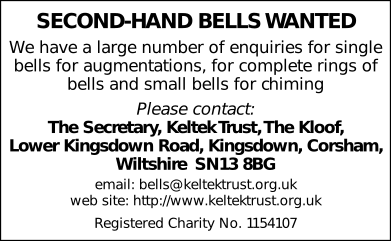 Sent for publication in The Ringing World on Thursday, 28 March 2019 at 19:10:31, and printed in issue 5633. This performance has been viewed 280 times.